It’s a fact that risk management takes time and money. If you have someone on staff whose main job role or background isn’t risk management, it could be taking even more time and money to assess your business’s risk level. Outsourcing those duties to a risk management professional will likely help you in more ways than one. In fact, we have three reasons you should consider outsourcing your risk management. By outsourcing risk management duties to someone whose background and experience is solely risk management, you can save your business a significant amount of time and money. A professional risk manager can get the job done quickly and accurately, as opposed to a staff member whose main role may be unrelated to risk assessment. It will simply take them longer to complete the task because it’s an unfamiliar role. Because an outsourced risk management professional isn’t on your payroll, you can save salary and benefit costs. By having your business’s risk management overseen by a professional risk manager, your business can have a plan in place before it’s needed. The true test of risk management is how soon you can open your doors after a catastrophe happens. Receiving professional advice and having a plan in place can protect your business’s future, reduce downtime, and allow you to get back to business sooner. 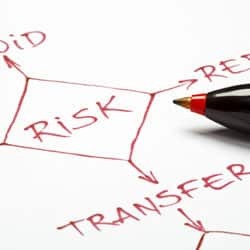 Most risk management professionals will put together a Risk Management Assessment by reviewing contracts for hidden exposures, assessing each risk, and recommending strategies while projecting future risk, among other things. Projecting future risk can be an especially important part of risk management. No one likes to be unprepared, and a projection of future risks can put you in control of the situation before it happens. Putting an important piece of your business into another’s hands can be scary, but it may be worth it in the long run. Outsourcing risk management can benefit your company in many ways. To find out how and get a quote today, call 800-686-8080 to speak with one of our Risk Management experts, or complete this Risk Management Services Consultation form.